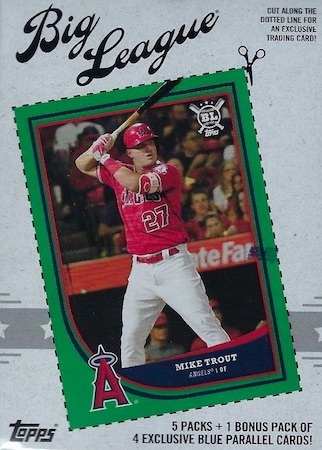 Answering the call from many for more sets geared to the youngest collectors, 2018 Topps Big League Baseball is a new, low-cost MLB brand. The fun release is a great way to introduce new collectors, especially kids, to the Hobby. 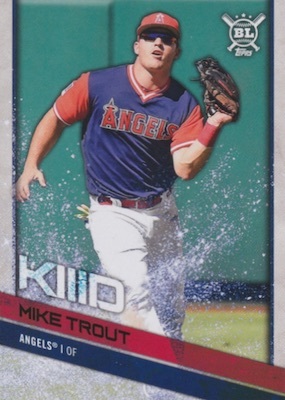 Big League joins other kid-friendly options like 2018 Topps Opening Day, but with original designs that don't rely on the flagship look. In addition to a large run of base and insert cards in each box, plus a parallel in every pack, the First Pitch promotion offers three different kids the opportunity to toss a pitch ahead of a 2019 MLB game. 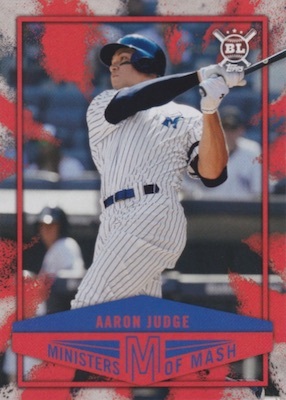 A fairly robust base set of 400 cards forms the core of the 2018 Topps Big League Baseball checklist. Beyond cards for the very best veteran and rookie players, subsets include All-Time Greats and Stat Kings. Speaking directly to the kids are themed choices such as Ballpark Landmarks. Gold parallels, which come one per pack, are joined by rare Rainbow Foil (#/100), Black and White Image (#/50) and Red Foil (1/1) versions. The Players Weekend Base Variation cards add the preferred nickname in big, bold letters. There are also rare Error Variations. There are also 60 insert cards split into two different 30-card sets. Options here consist of Ministers of Mash and Star Caricature. 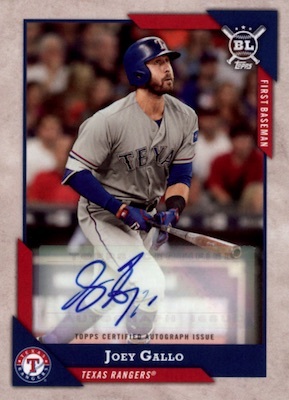 While the set is mainly about the base and inserts, 2018 Topps Big League Baseball still offers limited signed cards in all formats. 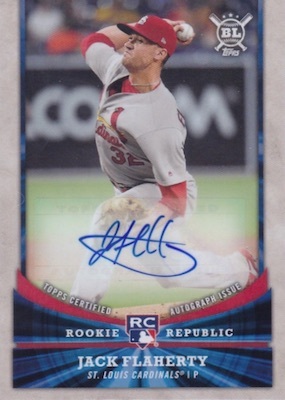 This includes the Big League Autographs line for the top players (and mascots), and Rookie Republic Autograph cards for some of the very best up-and-comers in the league. Numbered parallels for each signed set come as Gold and Red Foil (1/1), plus Black and White Image (#/25) editions. 400 cards. Buy base sets on eBay. PARALLEL CARDS: Gold (1 per pack), Blue (Blaster), Rainbow Foil #/100, Black & White #/50, Red Foil 1/1. 1:507 packs. Variations guide and gallery. PARALLEL CARDS: Gold #/99, Black & White #/25, Red Foil 1/1. 30 cards. Serial numbered 1/1. 1:34,866 packs. 4 cards. 1 per Blaster box. See the 2018 Topps Big League Baseball checklist spreadsheet. I haven’t seen it yet so I can’t rate it. I’m just curious if it’s geared toward kids why is it a Hobby issue not Retail? The solicitation sent by Topps was for the Hobby format, but it should also have a Retail version. 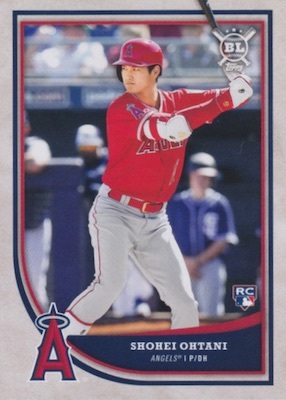 I love the fact that Topps is returning to its multiple player League leaders cards!! Looks great, similar to the Fleer products of the 90’s! I like the looks of this set better than Topps regular issue for this year. I am looking forward to the following insert sets. 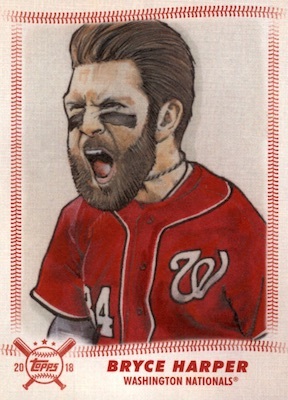 Big League will be released about four months after Topps’ annual low-cost and kid-oriented Opening Day product. What the new release might mean for that brand, if anything, isn’t clear yet. So what do you think is going to happen to opening day? I hope they do not get rid of it. I love the mascot inserts and some other inset sets. At Least Torres and Acuna made it but nit Juan Soto. Also, where is Jay Bruce. I thought Franchy Cordero had a rookie card in 2017 Update. For the price point Topps you almost nailed just one issue again no Eric Davis lol this one still should sale good!! Nice design. Low price point. First true rookies for Torres and Acuna. What’s not to like about it. Perfect product for both the kids and collectors on a budget. Has anyone seen this these cards at a store yet? I’ve been looking at several Targets & Wal Marts since July 11th and no luck. The is no entry level set while the new design is nice looking and has borders but it is still no entry level set. If is was Topps you would allow the kids to pull autos not 1 in 102 packs but how about 1 in 25 packs and what is with those sketch cards 1 original in 38,000 packs give me a lemon aid how are kids going to pull one of those, really Topps. Overall, it is still a nice binder set to build nearly done with the one I just started. How can you have an set called all time greats and not have babe ruth. That is like having a all time greats set in hockey and not having gretzky. Nice design and card stock. Really enjoy the collectibility of base set and insert sets due to price and number of cards. Insert sets are fun.